Chicago loses its Olympic bid, but just being a finalist could still bring benefits to Wisconsin. If Chicago had won the 2016 games, several cycling events would have been held around Madison. Even though the Windy City lost out to Rio de Janeiro, Dane County Executive Kathleen Falk says the build-up was still exciting and has helped to put Wisconsin on the map for cycling. She says have an Olympic stamp of approval on cycling courses in Dane County could attract interest from around the world. Former Olympian Bonnie Blair joined supporters in Madison to watch Friday’s announcement. She says Chicago being knocked out in the first round of voting was heartbreaking since it means the region won’t get a chance to experience the games first hand. 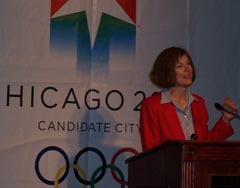 Blair says Chicago made a strong case for hosting the summer games and shouldn’t doubt the efforts put in to attracting the games.